Who says healthy lifestyle or diet equals to eating bland boring foods? Since I am both a foodie and a food scientist, I am sure there must be foods out there that are both good for our palate and health. This blog journals my attempts on finding such foods :). Guilty delight? That is so old-fashioned! Now is the era of Guilt Free Delight !! :D. I cordially invite you to join along this adventure. Feel free to comment or suggest foods that you believe can fulfill this criteria. Bon Appetit! What to do on a beautiful Sunday afternoon? A nice lunch would be so appetizing. Since I live to the principle of Guilt Free Delights, the foods that I consume should be healthy and delicious. So I finally decided to eat in a restaurant that claims its ingredient to be fresh and healthy, Madame Chang in Surabaya. After scanning through the menu, I chose to order Vietnamese Salad, and for the drink I was curious to try their Almond Milk. When the order came, I was so excited to savor it. As always, I did the ritual that must be done by a foodie, which is taking picture of the food and drink before enjoying it hehehe... I'll share the picture with you in this post :). The Vietnamese salad consists of lettuce, grilled chicken, pickled carrot and radish, vermicelli, cilantro, mint leaves, and garnished with crushed peanuts. It came with the refreshing sweet and tangy sauce, made from water, vinegar, and some seasonings. After finishing the salad, I felt full and satisfied. Although the restaurant is owned by an Indonesian and I guess that the chef is also an Indonesian, but they can make it to taste exactly like the Vietnamese salad that I had when I was studying in the United States. 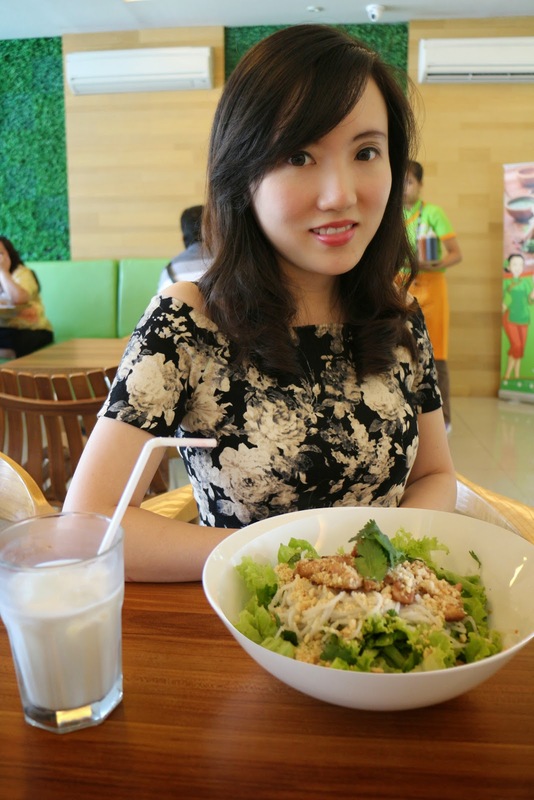 At that time, I have always eaten the salad in an authentic Vietnamese restaurant and prepared by a real Vietnamese. I enjoyed the salad without feeling guilty because I know that it is good for my health, and don't forget that it was delicious and made me satisfied. Remember the principle of Guilt Free Delights again :). Let me share with you from my perspective as a food scientist and nutritionist. The Vietnamese salad consists of ingredients that are beneficial for our health. Lettuce as the main ingredient of the salad contains a compound called ‘flavonoid’, which has been shown through some research that it has antioxidant properties. If you are actually aware, every day our bodies have to fight against many free radicals attacking us from many sides :(. The free radicals can come from the sun’s ultraviolet radiation, air and water pollution, etc. That is why we need antioxidants to help our bodies to fight those bad things. Chicken, especially skinless chicken breast, is a good source of protein. As we all know, carrots are good for eye health because it contains ‘carotenoids’, which are colored-pigments contributing to their orange color. The presence of subtances called ‘glucosinolates’ in radishes have been associated with a reduced risk of cancer, proven by some scientific research. How about the Almond Milk? I also took pleasure in it freely because it tasted good and refreshing. With almond milk, we can enjoy the well-known benefits of milk, without feeling worry. Recently, there have been some scientific findings that cow’s milk is actually not good for us as humans. The protein composition of cow’s milk is not compatible with human body. So what is the solution? Instead of animal sources, we can obtain milk from plant sources such as almond, soy, etc. Guilt Free Delight by RIA - N.P. Pangestu is copyrighted. Picture Window theme. Theme images by kcline. Powered by Blogger.